Does your resume demonstrate how accurately and efficiently you process loans? If not, borrow ideas from this sample for a mortgage loan processor. As a mortgage loan processor, your resume should demonstrate how accurately and efficiently you process loans, says resume expert Kim Isaacs. 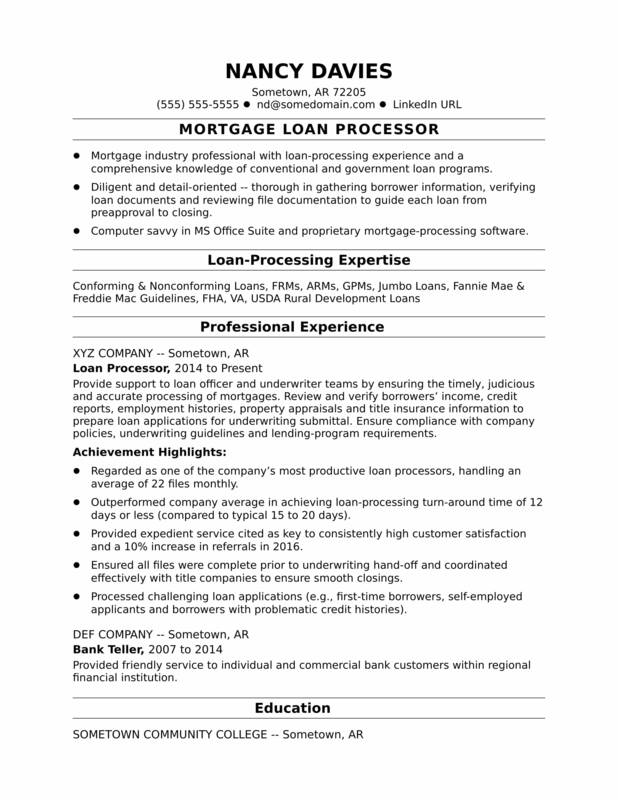 If your resume could use a little polish in that regard, borrow ideas from this sample resume for a midlevel mortgage loan processor that Isaacs created below. You can also download the mortgage loan processor resume template in Word. And if you need more help, get a free resume evaluation from the experts at Monster's Resume Writing Service. Jobs for mortgage loan processors are projected to grow by 11% (or 36,300 jobs) from 2016 through 2026, according to the Bureau of Labor Statistics (BLS). You'll find the highest level of employment for this job in the following states: California, Texas, Florida, North Carolina, and New York; and in the following metropolitan areas: New York City; Anaheim, CA; Los Angeles; Chicago; and Phoenix. As a mortgage loan processor, you can expect to earn a median wage of $64,660 per year, or $31.09 per hour, according to the BLS. Additionally, you can search for mortgage loan processor jobs on Monster. Mortgage industry professional with loan-processing experience and a comprehensive knowledge of conventional and government loan programs. Diligent and detail-oriented -- thorough in gathering borrower information, verifying loan documents and reviewing file documentation to guide each loan from preapproval to closing. Computer savvy in MS Office Suite and proprietary mortgage-processing software. Provide support to loan officer and underwriter teams by ensuring the timely, judicious and accurate processing of mortgages. Review and verify borrowers’ income, credit reports, employment histories, property appraisals and title insurance information to prepare loan applications for underwriting submittal. Ensure compliance with company policies, underwriting guidelines and lending-program requirements. Regarded as one of the company’s most productive loan processors, handling an average of 22 files monthly. Outperformed company average in achieving loan-processing turn-around time of 12 days or less (compared to typical 15 to 20 days). Provided expedient service cited as key to consistently high customer satisfaction and a 10% increase in referrals in 2011. Ensured all files were complete prior to underwriting hand-off and coordinated effectively with title companies to ensure smooth closings. Processed challenging loan applications (e.g., first-time borrowers, self-employed applicants and borrowers with problematic credit histories). Provided friendly service to individual and commercial bank customers within regional financial institution.